After the fall of the Berlin wall on November 9 1989 the trade between the former DDR and the West became much easier. 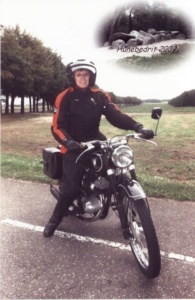 That was why you could find many East German motorbikes at oldtimer markets. On one of these markets my father found a trailer carrying three motorcycles. In those days you could by them cheap, that’s why my dad became three motorbikes richer for relatively little money including this DKW-IFA. 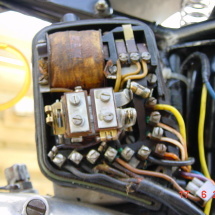 The RT125 gave some problems with the electrical system so now and then. Replacing heavily corroded wires solved the problems. 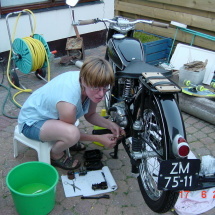 In 2013 I started a second restoration of the DKW-IFA. The first restoration had been done by my father in 1990/91 and since then there was hardly done anything. The paint at the bottom of the frame where the engine lies, was completely vanished, the mud guards showed pimples and the gas tank was damaged. In short the usage could be seen clearly. 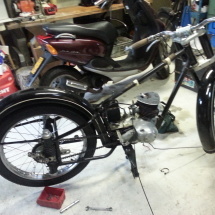 At Christmas holidays 2013 I disassembled the motorbike and brought several parts to the painter. The engine was snoring like a kitten, so I didn’t need to do anything to it. It took almost a year before the painter had painted the parts, but it was worth the waiting! 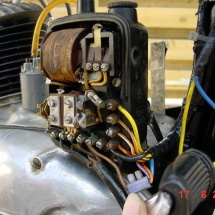 With the help of family members I reassembled the DKW-IFA and connected all the wires of the electrical system. Very soon my dad and I found out that the DKW-IFA had some current flowing and not when trying to start. If we were able to start it, because at some point the ignition key didn’t want to turn anymore. So we had to replace that part in the ignition case that allows the key to turn. After done that we had a look at the battery, because it had served for over 45 years. It was a NiCa-battery which was topped with Kalilauge (potassium hydroxide). The battery showed more and more of a rash and it turned out to be the cause of the electrical problems. 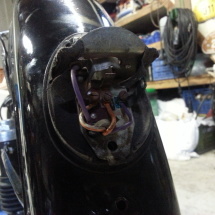 The wires were all corroded even those of the tail light! So the solution lay in the replacement of the wiring harness and the reconnecting of the electrical system which caused some effort, but in the end I did it with the help of some old fashioned measuring work and the electrical scheme. The DKW_IFA seemed to pull to one side, so the fine tuning had to be done. In the meantime it has been done and now it runs as always. In 1916, the Danish engineer Jørgen Skafte Rasmussen founded a factory in Saxony, Germany, to produce steam fittings. In the same year, he attempted to produce a steam-driven car, called the DKW. Although unsuccessful, he made a two-stroke toy engine in 1919, called Des Knaben Wunsch — “a boy’s desire”. He also put a slightly modified version of this engine into a motorcycle and called it Das Kleine Wunder — “a little marvel”. This was the real beginning of the DKW brand: by the 1930s, DKW was the world’s largest motorcycle manufacturer. Before World War II, the company had some success with forced induction racing bikes, and during the 1920s and 1930s, DKW was the world largest motorcycle manufacturer. After the war, the company made the RT125, 175, 250 and 350 models. The motorcycle branch of the company produced very famous models such as the RT125 pre- and post World War II. As reparations after the war, the design drawings of the RT125 were given to Harley-Davidson in the US and BSA in the UK. The HD version was known as the Hummer, while BSA used them for the Bantam. IFA and later MZ models continued in production until the 1990s, when economics finally brought production of the two stroke to an end. Other manufacturers also copied the DKW design, officially or otherwise. This can be seen in the similarity of many small two stroke motorcycles from the 1950s, including a product of Yamaha, Voskhod and Polish WSK. 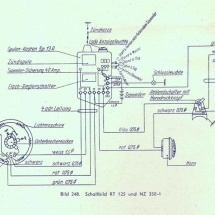 RT 125 can refer to a model of two-stroke motorcycle made by DKW in Zschopau in the 1930s, IFA and MZ in the 1950’s and early 1960’s, and DKW in Ingolstadt in the 1950’s and 1960’s. “DKW” stands for “Das Kleine Wunder” or “The Little Wonder”. “RT” stands for “Reichstyp” or “National Model”. 1950: The Zschopau works begins production of the RT 125 model, developed before the war, under the trademark IFA (Industrieverwaltung Fahrzeugbau). This model became patent free after the war and was further developed in Britain, USA, Japan, Italian and West Germany.